Santa wrote this letter from his workshop in the cold North Pole. He shares some secrets about his workshop and wishes the child a Merry Christmas. 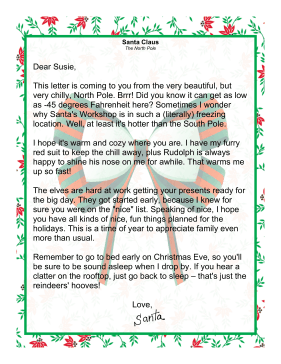 This letter is coming to you from the very beautiful, but very chilly, North Pole. Brrr! Did you know it can get as low as -45 degrees Fahrenheit here? Sometimes I wonder why Santa's Workshop is in such a (literally) freezing location. Well, at least it's hotter than the South Pole. I hope it's warm and cozy where you are. I have my furry red suit to keep the chill away, plus Rudolph is always happy to shine his nose on me for awhile. That warms me up so fast! The elves are hard at work getting your presents ready for the big day. They got started early, because I knew for sure you were on the "nice" list. Speaking of nice, I hope you have all kinds of nice, fun things planned for the holidays. This is a time of year to appreciate family even more than usual. Remember to go to bed early on Christmas Eve, so you'll be sure to be sound asleep when I drop by. If you hear a clatter on the rooftop, just go back to sleep � that's just the reindeers' hooves!